In this monthly Live Culture feature, I review the first 50 pages of a local book — and sometimes, if I feel like it, more. This month, let's celebrate warm weather by going outdoors with Walt McLaughlin. His latest memoir from the hiking beat is The Unexpected Trail: Taking on the 100 Mile Wilderness (Wood Thrush Books, 172 pages, $13.95). McLaughlin lives in St. Albans and has been published in Vermont Life, Conservationist and other nature-focused periodicals. He's also written a series of longer reminiscences from the trail, most of them self-published under the Wood Thrush Books imprint. (Here's my 2011 write-up of his Alaska memoir.) Regional publisher North Country Books put out his Adirondack backcountry narrative The Allure of Deep Woods, which my outdoorsy mom assures me is worth picking up. For those who don't know (like me), the 100 Mile Wilderness is the northern (Maine) extremity of the Appalachian Trail, the final destination of many thru hikers. McLaughlin isn't one of those punishment enthusiasts — er, lovers of the untamed wild. 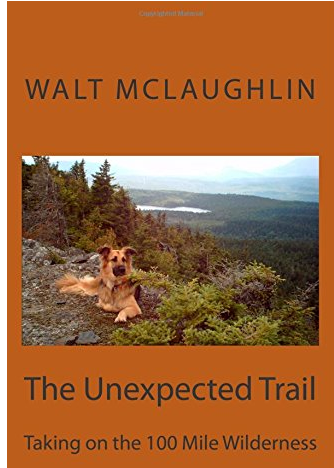 The book chronicles his 12-day trip on the AT from Rainbow Lake to Monson, Maine, accompanied only by his longhaired German shepherd, Matika. The time is August, the boreal woods muddy and muggy. A sign at the trailhead warns, "THERE ARE NO PLACES TO OBTAIN SUPPLIES OR HELP UNTIL MONSON. DO NOT ATTEMPT THIS SECTION UNLESS YOU HAVE A MINIMUM OF 10 DAYS SUPPLIES AND ARE FULLY EQUIPPED." Sound like the prologue to a horror movie? Spoiler alert: McLaughlin survived. What you're in store for is a blow-by-blow vicarious trip through the wilderness, crossed with a Thoreauvian meditation on its restorative qualities. "A coyote sits impassively along the side of the Golden Road as we shoot past in our car, plunging deeper into the Maine woods." "Despite the big brag of long-distance hiking, it's really no harder than putting one foot in front of another while toughing out the small stuff." "I want to take on this remote section of the Appalachian Trail while I still can. And I want to do it on my own terms, alone and completely unaided, before I'm too soft, old and fat to incur the risk." Will I read the rest? After reading the first 50 pages, I skimmed the rest to find out if McLaughlin would encounter any dire perils on the trail. I'm the kind of reader who secretly wants every outdoor memoir to involve an encounter with incestuous backwoods cannibals, cutting one's own arm off, fending off a bear or at least near-starvation. Blisters just don't cut it. That said, I can see the appeal of another, lower-key kind of trail memoir — and that's what this is. Once I got into the groove, I enjoyed reading McLaughlin's meticulous descriptions of the terrain, the routine and the other hikers he meets along the way. (They all have colorful "trail names," and many are exhausted, filthy, even "feral" as they complete their AT ordeal.) I feared for Matika when she lost her footing on a narrow bridge, and I worried with the author about how his fiftysomething body was holding up as he and the dog lugged 70 pounds of gear and supplies. McLaughlin isn't one of those writers who turn nature descriptions into poetry, but his style is clear and highly readable. The book is well edited, too, except for the occasional overabundance of short, choppy sentences, as if the prose had come straight from the author's trail journal. For those who would rather dream about a 100-mile wilderness hike than actually complete one, The Unexpected Trail is a pleasant armchair read. For those who are considering undertaking such a hike, McLaughlin's narrative could serve as a partial guide. And for those who just wonder why, he provides answers — some drawing on the eloquence of nature writers such as Thoreau and Scott Russell Sanders, some all his own. Perhaps McLaughlin puts it best when writing about a quiet dusk on Nahmakanta Lake: "Then I wonder which is the dream, this deep woods wandering I'm doing or that other life of mine back in the developed places. Hard to say." Perhaps it's that sensation that civilization has become the dream that draws McLaughlin back time and again to the trail. A note to authors: I choose books for this column at my own discretion. Please don't send me your book with a specific request that I feature it here (or not do so). Please don't ask for an explanation either way. And please recognize that these write-ups are not always "reviews," which would entail reading the entire book.